Pavement markings indicate the intended use for the trail; though, cyclists are not its only users. The Duboce Avenue Streetscape and Bikeway project is San Francisco's premiere car-free public space. Located in San Francisco's Castro District between Church and Market Street and adjacent to the J and N MUNI streetcar tracks, the project transformed a stark and run-down right-of-way behind a Safeway retail complex into a vibrant bikeway and pedestrian walkway. The bikeway connects cyclists traveling from downtown to what locals call, the Wiggle. As its name suggests, this bike route to Ocean Beach zigzags bicyclists around the grand hills of San Francisco allowing them to conserve energy and access the Pacific Ocean. What makes this bikeway so unique is the 6,000 square foot mural that runs the entire length of the back wall of the Safeway. Designed by Mona Caron and commissioned by the City of San Francisco Bike Program, the mural received the Precita Eyes Best New Mural 1999 Award. 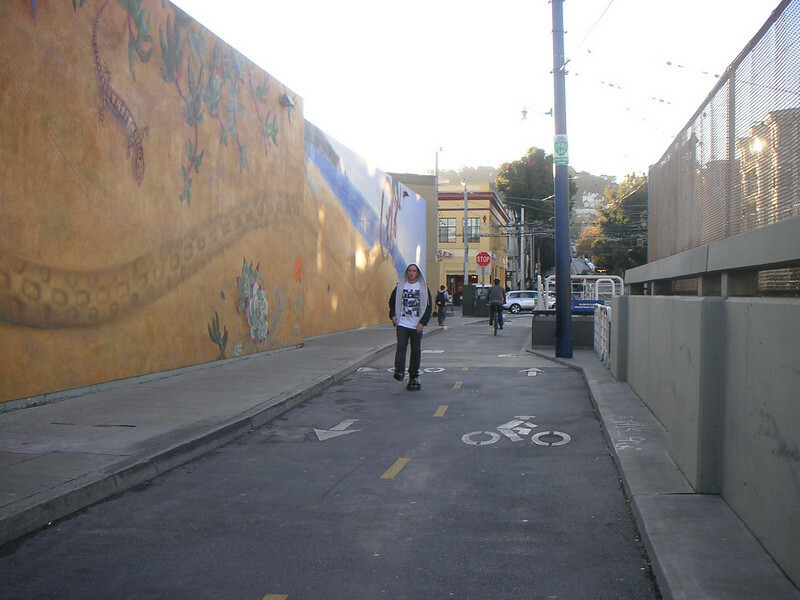 TE funding amounting to $410,000 was used to convert this portion of Duboce Avenue from motor vehicle to bicycle use. In addition, funds paid for landscaping and interpretive signage. The project received a local match of $250,000.